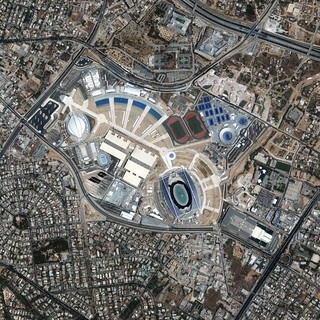 This high-resolution image shows the Athens Olympic Sports Complex. Acquired on June 24, 2004, by Space Imaging’s IKONOS satellite, the scene shows the complex in stunning detail, including the Olympic Stadium (home of the opening and closing ceremonies), the Olympic Aquatic Center, Olympic Indoor Hall (gymnastics and basketball finals), Olympic Tennis Center, and the Olympic Velodrome (cycling). Greece is the birthplace of the Olympic Games. Historians trace the origins of the Olympics back to 776 B.C., when ancient Greeks staged sporting events—part religious ceremony and part athletic contests in honor of the gods of Greek mythology—on the plains of Olympia. An “Olympiad” referred to the 4-year time interval between games. Citizens would come from all over the country to participate in the event in hopes of attaining the ultimate prize: an olive wreath and a “heroe’s welcome” upon their triumphant return to their city-states. As the games gained in popularity over the centuries, a standardized schedule of events and set of rules were adopted to govern the proceedings. And so it continued until 393 A.D., when Emporer Theodosius decreed that all “pagan cults” would be banned. In the late 19th century, as the citizens of Greece were celebrating their Declaration of Greek Independence, intellectuals such as Evangelos Zappas and Demetrios Vikelas were advocating a revival of the games “in the spirit of noble contests and Olympic ideals.” But it was French Baron Pierre de Coubertin who finally succeeded in re-establishing the Olympic Games. The first modern games were in held in Greece in 1896. Image copyright Space Imaging, Inc.
NASA Goes to the Olympics – View all the cities that have hosted the modern Summer Olympics, starting with Athens in 1896 thru London in 2012. There have been 29 Summer Olympic Games held in 22 different cities. Repeating host cities include Athens, Paris, London and Los Angeles.